This update has taken much longer than originally planned because we had to change quite a lot of stuff under the hood to prepare the app to support the Electroglottograph (EGG) display. Most notably, all editions now have better support for stereo files and allow switching the displayed stereo channel on the fly. This version also completes all features from Overtone Analyzer 4.0 that were still missing, such as the textual pitch and cursor info display on top of the spectrum. 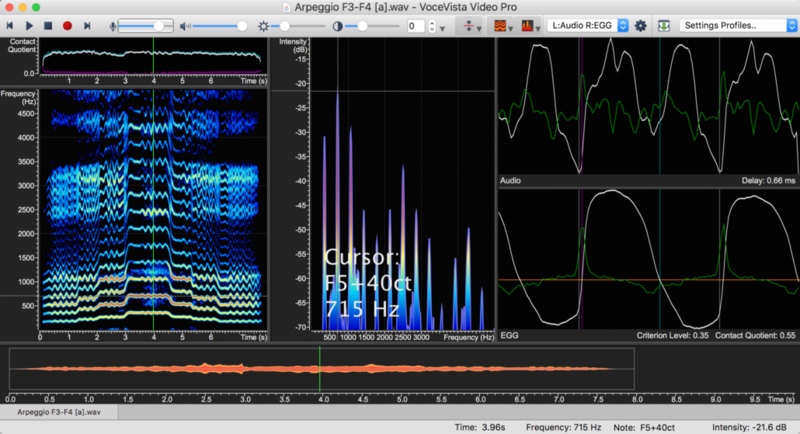 This is a free update for all users of VoceVista Video / Overtone Analyzer 5.x. If you have a license for those programs, you can simply download the latest edition from our download page and install it over the old one. To upgrade from the older Overtone Analyzer 4.0, please contact us for details about how to buy a renewal license. Version 5.0 was the first release of our software that was not only for PC but also for Mac. The 5.x product line had been in development for quite some time, and even though it still has some bugs and not all features from the 4.x line are completely ported, we felt that it was already useful, so we decided to release it instead of making everyone wait even longer for the Mac version. 5.0.2 continues to fix bugs and port features that were already in 4.0, and to make the app more compatible with the original VoceVista 3. The biggest change in 5.0.2 is the new mouse cursor behavior. moving the mouse across the spectrogram would immediately show the spectrum for the time position of the cursor. Clicking on a time position would set the cursor to that position and reset the selection. Click+drag would set the selection. Moving the mouse pointer by itself has no effect. Clicking, or clicking and dragging, sets the playback cursor and the position shown by the spectrum. You can change the mouse cursor behavior back to the old way in the Advanced Settings. The status bar has now labelled every value to make it easier to read. The mouse wheel emulation (by pressing the 1 and 2 keys) is working again. The mouse wheel operates even on inactive views in tiled mode. 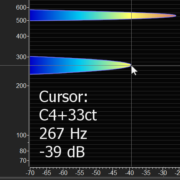 Drawing of Overtone Sliders and Undertone Sliders now works in all orientations. Double-click for all note slider operations is working again. Note sliders are refreshed immediately when the view settings change. The notation system is changed automatically to Scientific when the app language is English. MIDI input to drive the piano is working again.